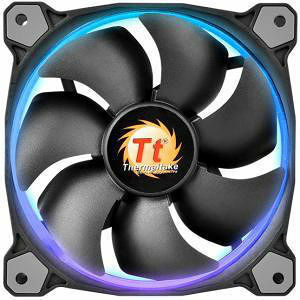 The latest Riing RGB Series fan introduced by Thermaltake is a patented circular 256 multi-colored 140mm radiator fan. Users can freely adjust fan speed as well as fan colors by clicking "MODE", "PLAY/PAUSE", and "SPEED" button on the fan controller. The fan blades are optimized to enhance static pressure for an impressive cooling performance. Hydraulic bearings for silent operation guarantee ultra-low noise, and the anti-vibration mounting system strengthens the product's stability during operation. The color and brightness uniformity of the multicolored LED ring is visible from all directions and adds style to the chassis.